Big Julie. The Original JC. The man who put his boot on the throat of the crumbling Roman republic and started the wheel turning that would result in its demise. Was he a hero or a villain? 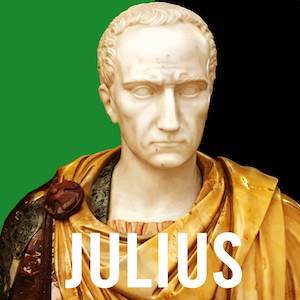 The first 5 episodes of the JULIUS series are available for free (click here to listen to them) but if you want to listen to the whole series (46 episodes plus 17 VIP episodes), you'll need to sign up to be a subscriber for $5 a month. "This is what it would sound like if the morning radio DJs took over the History Channel." Don't be mistaken though - we take the history very seriously. Each episode is 99% serious history and 1% clowning around. Over 60 episodes we pieced together the story of the rise and fall of Julius Caesar, using a range of modern and contemporary sources as our guide. Deep history combined with some filthy humour, 80s music and contemporary political and religious commentary. You can listen to the ongoing (TIBERIUS) series (which started August 2018) for free. The AUGUSTUS series (which ran from 2015 - 2018) is also currently entirely free. The Life of The Caesars Podcast by CAMERON REILLY & RAY HARRIS JR is licensed under a CREATIVE COMMONS ATTRIBUTION 4.0 INTERNATIONAL LICENSE.